With a special performance of Sacred Harp Singing. Carole P. Kunstadt received her BFA, from Hartford Art School and continued with postgraduate studies at the Akademie der Bildenen Künste in Munich, Germany. Having recently relocated to Woodstock, NY from New York City, as a collagist, painter, book arts and fiber artist, Kunstadt often invokes other people’s histories in the materials she uses which gives her work a metaphysical quality of timelessness. Kunstadt’s recent works reference the material of books, deconstructing paper and text, and using it in metaphorical ways. Her devotion to books is inspired by the ability of the written word to take the reader to other places through stories, poems, and prayers. Kunstadt’s process reveals how language can become visual through re-interpretation. Kunstadt’s work is currently featured in WORD 2016 at The Hudson Valley Center for Contemporary Art, Peekskill, NY; and was recently shown at The Everhart Museum of Natural History, Science & Art, Scranton, PA; and Gallery 66 NY, Cold Spring, NY. Her work has been shown at The Museum of Biblical Art, New York, NY; The Museum of Arts & Design, New York, NY; The Gershman Gallery at the University of the Arts, Philadelphia, PA; The Joseloff Gallery/Hartford Art School, CT; Manifest Creative Research Gallery, Cincinnati, OH; The Drawing Rooms, Jersey City, NJ and numerous others. The PBS/OFF BOOK Book Arts mini-documentary in the series on progressive arts, features Kunstadt in the segment Transforming the Sacred. Two ongoing series are featured – The Sacred Poem Series is a vehicle for the expression of gratitude, the exploration of life’s vulnerabilities, and as a platform for sanctity and contemplation. 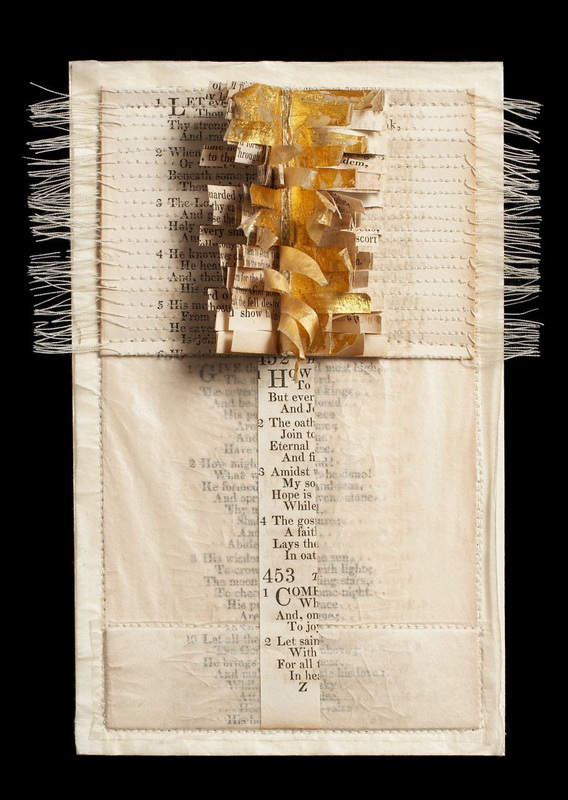 The primary element used is paper: the pages are taken from two antique volumes of a Parish Psalmody whose pages are manipulated and recombined, resulting in a presentation that evokes an ecumenical offering: poems of praise and gratitude. The Markings Series incorporates fragmented lines of script from a New England journal dated 1860’s which provide flowing, curvilinear marks on paper – fluid, sepia toned strokes with an implied history, juxtaposed with color fields of gouache and thread. Past and present meet in an intimate and delicate manner.